While the video seeks a faithful representation of reality, its unfolding outside the screen seeks to replicate the image. 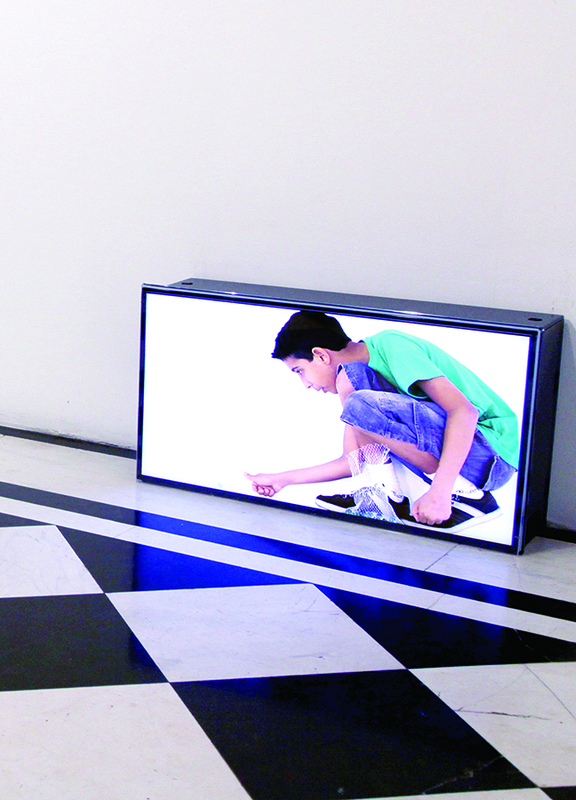 The device created by the artist swindles the spectator’s eye, confusing its perception, creating interfaces with “new spaces”, and articulating material reality and the virtual world. Celina Portella works with visual arts and dance, investigating issues about the representation of the body through video. She was considered for the I Programa de Fomento a Cultura Carioca, and for Rio de Janeiro’s EAV Parque Lage’s Núcleo de Arte e Tecnologia scholarship. She participated in the Centre Récollets residency in Paris, the LABMIS in São Paulo, among others. She was nominated for the Bolsa ICCO/sp-arte 2016 award, the EFG Bank & ArtNexus award in 2015, the Pipa 2013 award, and she won a prize at the II Concurso de Videoarte da Fundaj, in Recife. She took part on the III Mostra of the CCSP Exhibit Programme, the Mostra Verbo at Galeria Vermelho, and the Mostra SESC de Artes, among other exhibits. As a dancer and co-creator, she worked with the choreographers Lia Rodrigues and João Saldanha.